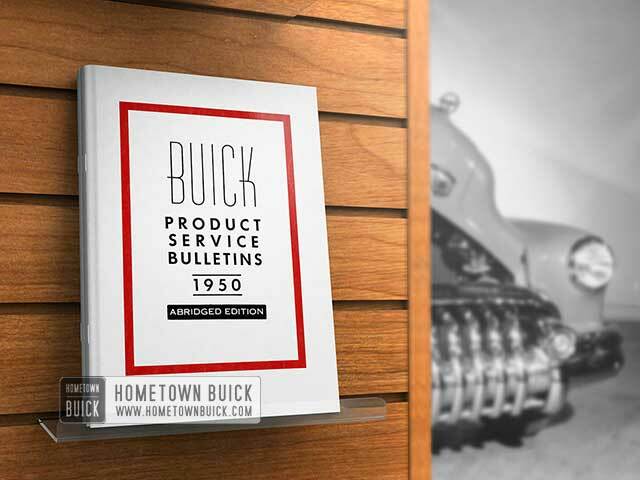 Effective approximately February 15th, the 1950 Buick Carburetor (Stromberg) will have a redesigned main body, in which the fuel level will be at the bottom of the inspection hole threads. This change was made because of the difficulty in accurately checking fuel level with the first type carburetors. As illustrated in Figure 7, the new type 1950 Buick carburetor can be readily identified by the boss at the inspection hole. This boss is increased in diameter and is flanked by two horizontal ribs approximately 1/4″ long and 1/16″ wide. In addition, the inspection hole is lowered so that it is not located in the exact center of the boss. All specifications and adjustments, with the exception of the fuel level, remain the same as specified for the first type 1950 Buick carburetor. The same procedure may be used for setting the earlier vacuum type and the later atmospheric type dash pots on Dynaflow cars. A. different procedure has previously been given for each type. The following procedure supersedes all previous instructions on adjustment of Dynaflow throttle linkage and dash pot. With engine HOT and idling at 450 RPM, check clearance between the stop on lever at lower end of equalizer shaft and the shaft lower bracket. See Figure 8. If clearance is not 1/32 ” to 1/16″, adjust throttle operating rod at ball joint to obtain 1/32″ to 1/16″ clearance. Tighten lock nut. With engine shut off, check for full opening of throttle valve when accelerator pedal hits the floor mat, which must be in place. Full opening should be obtained when pedal strikes floor mat, rather than having the stop on throttle lever strike hard against the boss on throttle body. Adjust accelerator pedal rod at ball joint, if necessary, to obtain full opening of throttle valve. Tighten lock nut. See Figure 8. Hold choke valve closed and check for proper operation of choke unloader when accelerator pedal is pressed to floor mat. If choke un­ loader does not operate properly, adjust as described in 1948-1949 Buick Shop Manual, paragraph 3-23 (Carter) or 3-30 (Stromberg). Hold choke valve closed, insert a .030″ feeler between the adjustment or stop screw and the fast idle cam, then turn adjusting screw on dash pot operating lever until it contacts the dash pot plunger button. See Figure 8. This gives a starting setting which may require alteration to obtain proper dash pot control. With transmission in Direct Drive and brakes firmly applied, snap throttle open and immediately release accelerator pedal. If engine returns to idle too slowly, back out dash pot adjusting screw a little at a time until proper dash pot control is obtained. If engine returns to idle too fast, causing engine to stall or roll, turn adjusting screw in. 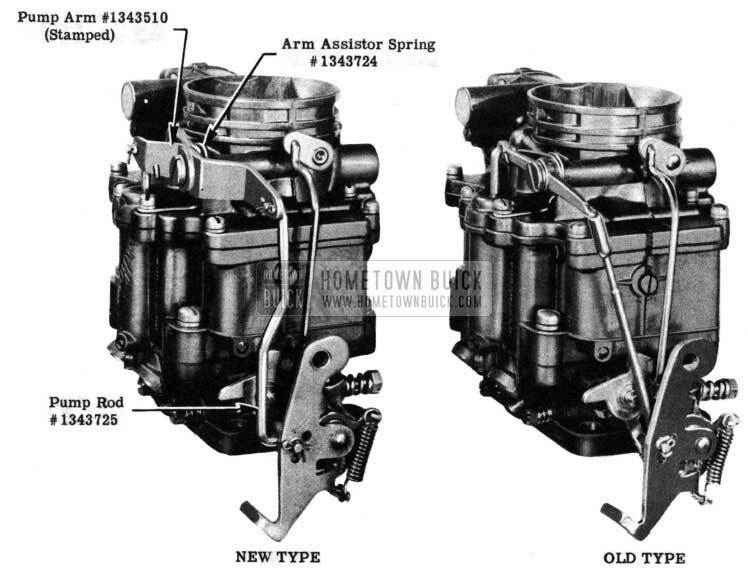 A change has recently been made in Stromberg Carburetors for 1950 Buicks, Part Nos. 1339690 and 1339692, to eliminate trouble caused by the starter switch slide sticking in the housing. A new stamped pump arm is used in connection with a new starter switch assembly that has a stronger contact spring made of .026″ diameter wire. Older type springs were .024″ diameter. These improvements also necessitated a new pump rod and arm assistor spring to maintain proper closing of the throttle (See Figure 9). The new switch will be identified by a letter “A” stamped on the side of the housing as shown in Figure 10. We wish to emphasize that this switch is only adaptable to 1950 Buick carburetors having the new stamped pump arm and assistor spring. Under no circumstances should it be assembled on 1950 Buick carburetors not having these features. We are receiving many complaints that trouble is experienced with choke operation when attempting to restart a car that has been driven a short distance. A good share of this trouble has been traced to faulty adjustment of the choke unloader. We strongly recommend that the unloader linkage be checked and adjusted, if necessary, when the new car inspection is made. Along this same line, customers should be advised that if the engine becomes flooded, easier starting will result if the accelerator pedal is depressed all the way to the toe board. In the near future some 1950 jobs will appear with 1950 Buick Carter carburetors designated as 725SA on 40-50 cars and 726SA on 70 jobs. This change involves relocation of the bowl vents to the rear side of the air horn in order to eliminate gasoline odors when the car is in motion. In the event that it is desirable to relocate the vents on 1950 Buick Carter Carburetors in service, it will be necessary to install the new type air horn and air horn gasket. In addition two holes must be drilled in the bowl cover to coincide with the location of the vents on the new air horn. This can be done by placing a new type air horn gasket on the bowl cover and scribing the location of the vent holes, in the gasket, on the cover. Drill with a 1/4″ drill. The location of these holes is not particularly critical, but they should be held within reasonable limits. *Parts required to convert first type. Instructions given in the 1948-49 Shop Manual, paragraph 3-33 (a), item 6, for installing reducer wires in 1950 Buick Stromberg carburetors are incorrect. This paragraph should read: Place new gasket on main body. Insert short ends of reducer wires in idle channels in throttle body, and guide long ends of wires into idle channels in main body as bodies are assembled together. Install screws with lock washers. Kindly make the necessary correction in the shop manual. 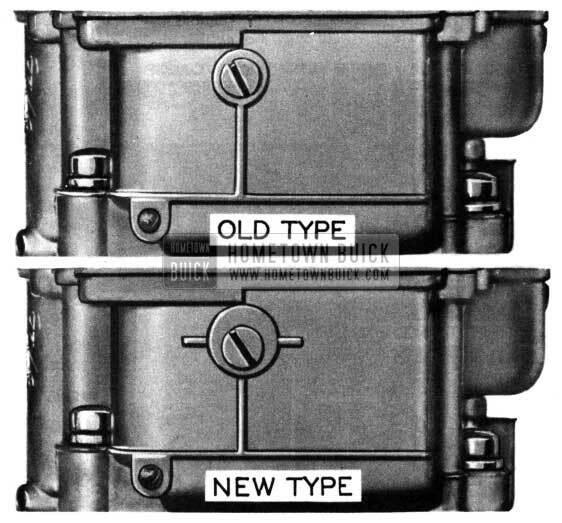 We have been notified by the Parts Department that they will no longer service vacuum type dash pots for 1948-70, 1949-50-70 and 1950-40 first job Dynaflows. In view of this, it will be necessary to use an atmospheric type pot when making replacement on the above jobs. Remove old dashpot and pot-to-manifold vacuum tube and hose. Remove vacuum booster line at manifold, replace “T” fitting on manifold with Group No. 8.963, Part No. 137405, 1/4″ Connector, and replace booster to manifold line. Install atmospheric type dash pot as specified for Model. Set engine idle at 450 RPM – Hot. 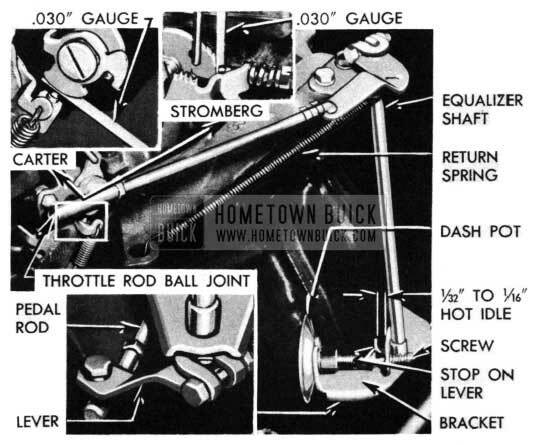 Follow complete throttle linkage and dash pot adjustment as outlined in the 19’50 Buick Shop Manual, Section 3-c, paragraph 3-8 (b), page 3-11. All 1950 models are now equipped in production with a Moraine Products gasoline filter of entirely new design. The new filter utilizes a porous bronze filtering disc which is an integral part of the filter and cannot be replaced in service. A drain plug is provided at the bottom of the inlet side which allows water and other accumulation to be easily removed. When a thorough cleaning is desired, the filter should be removed, swished-around in a suitable solvent and blown-out with an air hose in the outlet side. Make sure that the drain plug is removed before blowing air through the filter. 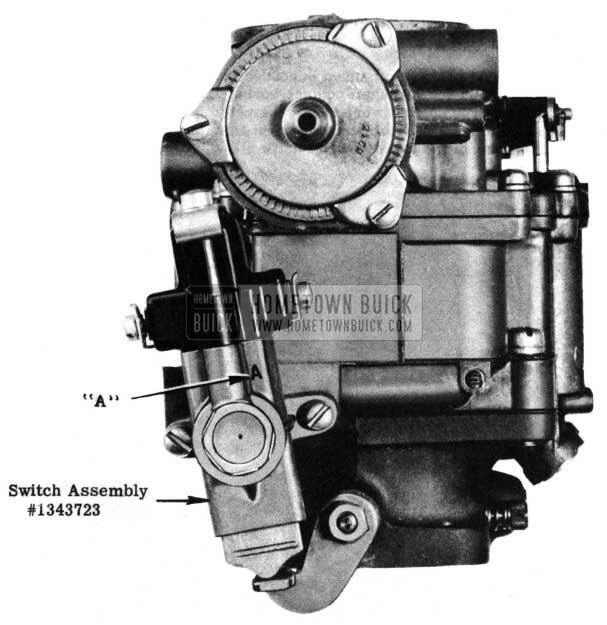 A short time ago, the 1950 Buick carburetor made by Stromberg were equipped with a Pump Arm Assistor Spring, Part No.1343547, Group No.3.780, designed to provide more positive throttle closing. In case where the throttle will not return to proper idle position, it is advisable to equip earlier jobs in the field with this assistor spring.